Amaterasu is the sun goddess of the Shinto Faith. She is one of the most loved of the Japanese deities and there are many myths surrounding her. Amaterasu lives a peaceful life in harmony wit the workings of nature, shining brightly among her herd of horses and gardens full of silk worms for her weaving. However, her brother Susano’o is much more disruptive and chaotic. In some versions of the story, Susano’o became jealous of his sister and slaughtered her horses and her silk worms. When Amaterasu came upon such a gruesome and shocking scene, she felt so overcome with grief and hopelessness that she retreated into a cave. This left the earth with no life-giving sun, and all grew cold and dead. The earthly plane became a haven for evil spirits, and people began to die from lack of food. The other gods and the humans waited outside Amaterasu’s cave and tried everything to get her to come out again. She refused, never wishing to show her face again. As things grew desperate, Uzume, Amaterasu’s sister, had an idea. She began to dance and sing loudly and comically. The brought a roar of approval from the assembled crowd, and their laughter rang across the world. Amaterasu became curious, listening to these lively, happy sounds, and decided to peek out of her cave. Uzume was prepared and had placed a mirror just outside the cave. 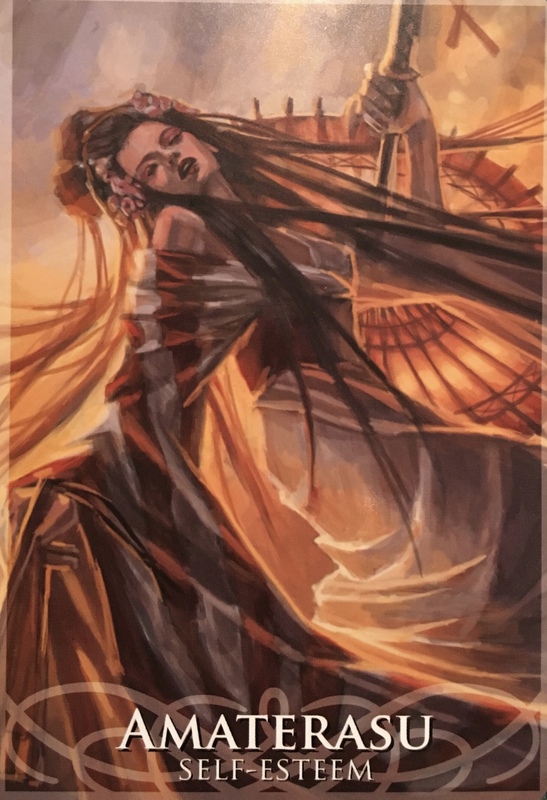 When the bright light of dawn that was Amaterasu’s energy hit the mirror, the goddess was bedazzled by her own reflection, and Uzume was able to pull her out of the cave. The world again became a better place by her presence, and Amaterasu understood her true worth. Call upon Amaterasu when you are feeling low in self-esteem and when you feel like you are not enough. Amaterasu’s very name means ‘to shine in heaven,” and this is what this goddess encourages us to do – let our own light shine. First, we have to understand ourselves a little better and know how truly important we are – to those around us and to the world at large. Without building true self-esteem from the inside out, creating a true love of ourselves, we are limited in what we do. There is a saying “whatever you believe yourself capable of, you are correct” basically, whether you believe you can attain your goals, or whether you believe that you will never attain them, you are correct. What you expect is exactly what you will receive. If you believe nothing good will come of a situation, you are probably right. If you believe that you are too old to learn something new, or too stuck to change, you are right about that too. The image of the cave is a metaphor for our belief systems and our self-imposed limitations. Imagine the cave walls to be what you have set as your perception of what you are capable of, or worthy of receiving. The cave is stone, the walls are thick, the ceiling is so low you can barely stand up to your full height. The cave is stifling, it’s hard to move, to breathe. Yet there you are, feeling quite safe if not a little restless in your cave. The exit is right there, but it is scary to contemplate what lies beyond the perceived safety of your protective cave. But what is the cave is actually more of a prison than a protection? What if instead of keeping you safe, it is actually holding you back from your true potential? What if it is keeping the love of your life at bay? The career of your dreams beyond the walls? Everything you dream of and more, beyond those rock solid walls of belief systems? It’s time to step out of the cave into the bright sun. Into the expansiveness beyond the cave.